I’ve always felt the western and horror go hand-in-hand, even though it’s a hybrid that’s only been explored briefly. Jonah Hex and Desperadoes are the most famous titles to have incorporated both genres with successful results, and while there have been others throughout the years, in hindsight, it’s still an untapped gold mine of cross genre storytelling waiting to be milked for all it’s worth. But if you want to strip it back even more, the Wild West hasn’t been relevant in comics for a while. Which is why Reddin is a breath of fresh air. The story follows Dean Driver and Karl Kirkwood, two friends and bounty hunters with an unbreakable bond and widespread reputation for getting the job done. During their ventures they’ve faced many dangers and lived to tell the story (and claim the rewards), but their latest mission involves horrors they haven’t experienced before. What starts off as a seemingly routine job turns into a nightmare of the supernatural kind, involving an ancient devilish entity who goes by the name of Reddin. Reddin incorporates two storytelling mechanisms we’ve seen before: The Faustian pact and the Old West revenge tale. It’s simple, yet effective, as the results are entertaining and chilling, with strong characters and dialogue that dances off the pages. The cowboys are foulmouthed and gritty; whereas the demonic villain on the is a well-spoken, charming manipulator who exudes pure evil. You can really tell co-writers Matt Fitch and Chris Baker had fun writing this; it’s vibrant, lively and not a single line is wasted with word combinations that aren’t excellent. Conor Boyle’s artwork is special, especially during the more horrific parts in which it becomes quite unsettling – I mean that as a compliment. There are images in Reddin that will stick with you, and send a shiver down your spine if you think about them for too long. For the most part it looks like a gritty Western, but when the supernatural aspect creeps in, the visuals are nightmarish and haunting. 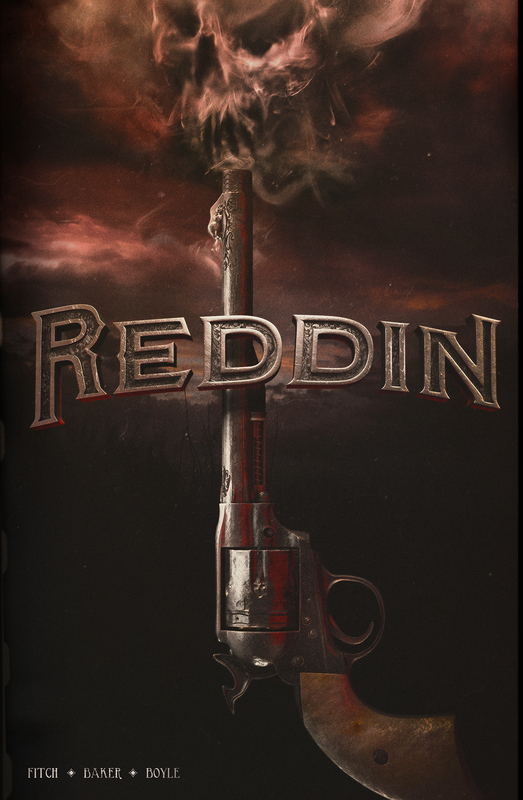 Overall, Reddin is a satisfying, genre-mashing treat, rich with splendid artwork, terrific dialogue and strong characters. It left a strong impression on me and I can’t wait to see what these guys do next. Hopefully they’ll revisit this world at some point. The Kickstarter for REDDIN is still underway, and tantalisingly close to being fully funded at time of writing. If you like the sound of the book (and why wouldn’t you? ), you could do a lot worse than CLICKING HERE and backing it.